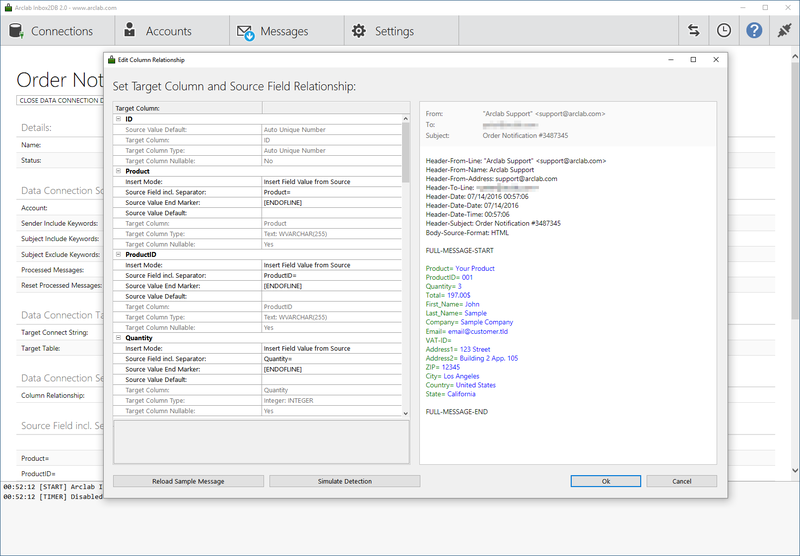 Arclab Inbox2DB is a software program for Windows to extract data from incoming email messages (e.g. sent by a form) and export the data to a MySQL database. There is no installation on your webserver required: Inbox2DB runs on your local computer and connects to the selected mailbox. It collects data from incoming email messages and adds a new record to your MySQL database for each message. The unique features of Inbox2DB and the flexible collection engine allows you to to integrate external data - sent via email - into your database. The data included in the email message will be mapped to the data type of the MySQL database automatically, so you don't need to care much about data types. It supports U.S. and European input formats, like e.g. 24/12/2014 and 24.12.2014 as date, $1.99 and 1,99€ as currencies, etc. In addition to the form data, the message source code and file attachments can also be stored in the database. Arclab Inbox2DB is an email automation solution and email parser software for your Windows PC to automate your inbox, collect data from incoming messages and insert the information into a database. Download Arclab Inbox2DB and test the software for 14 days without limitations. Important: The MySQL ODBC Connector (32bit) must be installed on your computer in order to connect to your MySQL server. Inbox2DB is a 32bit-Windows executable, so it's required to install the 32bit version of the ODBC driver as well. Create a new "Data Connection" in Inbox2DB until you reach "Data Connection Target". 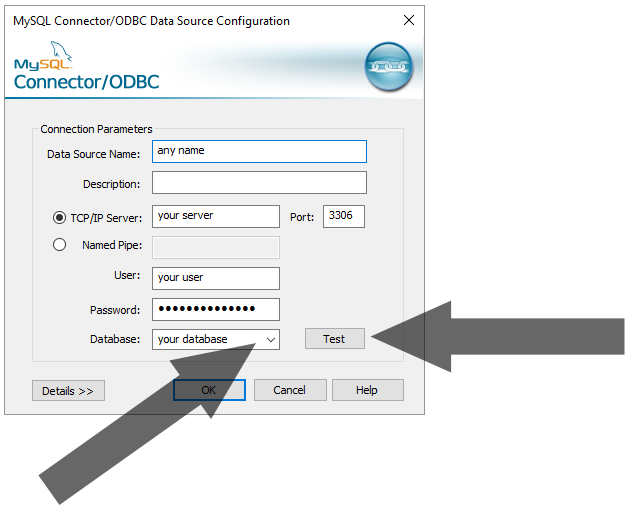 Select "ODBC Data Connection" as "Data Connection Target". Select your existing MySQL DSN or click on "New" to create a new user (or system) DSN. Select "MySQL ODBC x.x Unicode Driver". The "Data Source Name" is the name which identifies the source. You can type in any name here, e.g. "MySqlDB". We recommend to avoid spaces and special chars in the "Data Source Name". The "TCP/IP Server" is the server name of your hosted MySQL (web) server. Take a look at your (hosted) control panel or ask your web administrator if you don't know what server name you should enter here. Enter your MySQL "User" and "Password" and click on "Test". Make sure you've selected the "Database" in the MySQL Connector Configuration - otherwise you won't be able to access any database tables!